Streets outside schools can be very busy places at drop off and pick up times and so we would always encourage families to walk, scooter or cycle to school, where ever possible. There is lots of useful information and resources on the Living Streets Website. Click on the picture below to be taken to the site. There is a bike rack for families to secure children’s bikes and scooters to, ready for the end of the day. Please bear in mind that it is uncovered and that parents will need to provide their own locks to secure these. The bike rack is located just before the playground entrance on the Whitby Road end of school (Reception Playground). We encourage children to wear their helmets when riding to school and ask that children do not ride cycles and scooters along the paths on the school site. If you need to drive to school, there is limited on-street parking. However, we have an arrangement in place with Ryedale District Council, where you can purchase a permit for up to two cars at an admin charge of £5 so that you can park in the Eastgate Car Park until 9.15am and between 3.15 and 3.40pm. Please click on the links for further information and an application form. Never park on the zigzags – not even for a minute. The zigzags are there so children can see the road and be seen from the road, as they leave school. Never park or turn on school grounds. Never park on corners, block driveways or entrances. Slow down – Younger children find it hard to judge the speed at which a car is travelling and may cross when they should not. The slower you are travelling, the faster you will be able to stop. Respect the School Crossing Patrol – Do not assume that someone else will stop, never drive on until the crosser and children are safely on the pavement, do not park where the crossing patrol is working. Take responsibility for the road at the front of our school. Do not walk your child through the school car park. Consider setting up a car share scheme with friends. It will save you time and money and you can still help cut congestion and pollution. If children are entitled to a school bus pass and will be using this then please ensure that you let the school office know. Bus children will bring home a form to complete each half term so that we have a record of when children will be arriving on and leaving on the school buses. Please click here for an additional copy of this form. Please let the school office know as soon as possible if there are any changes to usual bus routines for your child. To find out if your child is entitled to a bus pass, please contact Harrogate Education Office on 0845 0349 467. 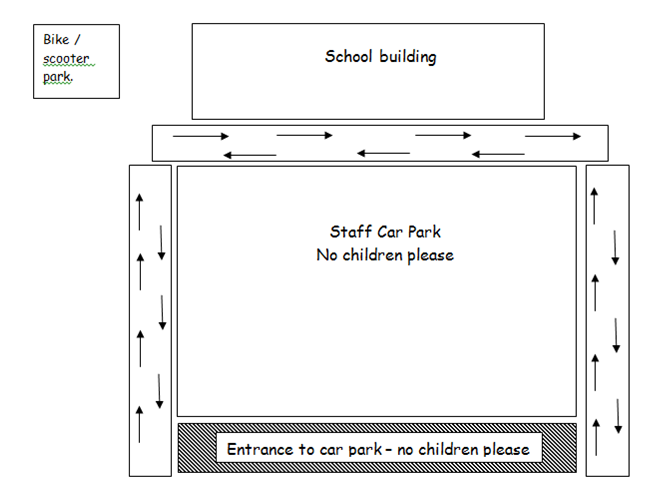 The safety of our pupils is always paramount and that is why we ask that parents do not walk across the car park at drop off and collection times but rather use the paths to the right and left of the car park (see the map below). The reason for this arrangement is that many of our support staff arrive between 8.45 and 9am and leave between 3.20 and 3.30pm. They often reverse into and out of the car park. The support staff are always vigilant and try to ensure that there are no children behind them as they reverse, but to minimise the risk we would stress the importance of using the paths.